While Donald Trump and his ilk claim that victimhood is exclusive to the coastal, “politically correct” elite, I find that feelings of victimhood are central to Trump’s appeal. Trump supporters believe that whites and Christians face discrimination while people of color reap the benefits of government largess. Far from being concerned about “facts, not feelings,” Trump supporters and the conservative movement have created a false narrative of victimhood that motivates their supporters. I examined "feeling thermometer" scores in the 2016 American National Election Studies (ANES) pilot survey (which asks respondents to rank politicians and groups from 0, meaning coldest feelings, to 100, meaning warmest feelings) to explore how they measured feelings for Trump among white respondents, based on their views of discrimination against whites and Christians. Among whites who believe that white people face no discrimination, the mean feeling thermometer score for Trump was 25 (cold), compared to 64 (warm) among those who believe whites face a “great deal” of discrimination. 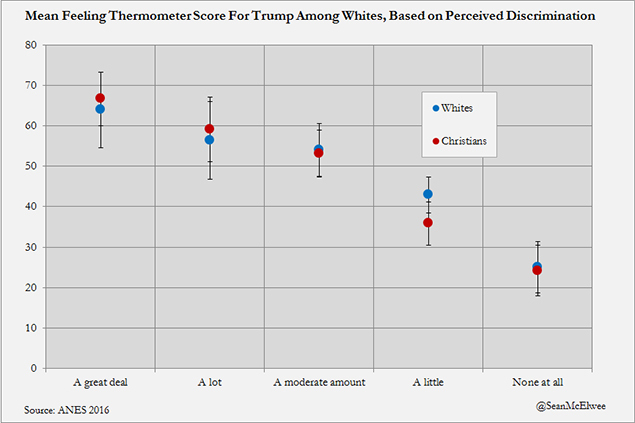 Among whites who believe Christians face no discrimination, the average feeling thermometer score for Trump was 24, compared with 67 among those who believe Christians face “a great deal” of discrimination (see chart). Among independents and Republicans, those with strong feelings that whites and Christians faced discrimination were more supportive of Trump in the Republican primaries (the ANES survey was completed in January). Among white Republicans and independents who believe whites face no discrimination, 69 percent supported a Republican candidate other than Trump. Among those who believe whites face a “great deal” of discrimination, only 34 percent did. Among those who believe the government treats whites much better, 72 percent chose a candidate other than Trump, whereas among those who feel the government treats black people much better, 49 percent did. Among Republicans, but particularly among Trump supporters, feelings of white discrimination and loss were profound. Among white Democrats, 74 percent said whites face “little or no” discrimination, compared to 51 percent of white Republicans. While 75 percent of white Democrats said Christians face “little or no” discrimination, only 30 percent of white Republicans did. 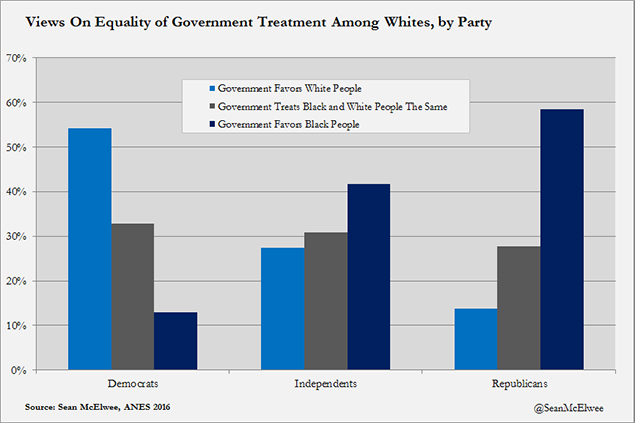 As the chart below shows, there are deep partisan divides in perceptions on whether the federal government favors white people or black people (or treats both equally). To paraphrase a popular idiom, when you’re accustomed to privilege, equality feels like discrimination. These data suggest that this feeling of loss and victimization, and the need for racial solidarity to protect what remains, is core to understanding Trump's appeal. As I’ve noted before, beliefs in the importance of white racial solidarity are powerful predictors of Trump support. Whites who believe their race is “very important” to their identity had warmer feelings toward Trump. Trump’s rhetoric reflects this reality: He has described a world in which his white supporters are the victims of bad trade deals, elites and rampant crime. They feel they are living through rapid demographic change that will leave them as a minority of the population -- and they know how minorities have been treated for so long in American populations. Far from being an invention of the politically correct, victimhood has been a talking point of the right ever since Burke decried the mob’s treatment of Marie Antoinette. The conservative, to be sure, speaks for a special type of victim: one who has lost something of value, as opposed to the wretched of the earth, whose chief complaint is that they never had anything to lose. Trumpism is a movement built around the loss of privilege and perceived social status and a desire to re-create social hierarchy. It is one that requires its adherents to live in a state of constant fear and victimization. This mythology requires extensive ideological work and media filtering to remain true. Conservatives must create an ideological bubble in which crime is out of control (instead of hovering near historic lows), the rate of abortion is rising (instead of falling), refugees are committing terrorist attacks en masse (they aren’t at all) and immigrants are taking jobs (it’s the capitalists), all while the government is funneling money to undeserving black people (black people receive government support in accordance with their share of the population, despite making up a disproportionately large share of the poor). Conservatives, and many in the general public, believe that Muslims and immigrants (both legal and unauthorized) make up a dramatically larger share of the population than they actually do. At the same time, the right has created a caricature of their opponents on the left. In this imagined caricature, the left is sensitive to being “triggered” at every corner, but also capable of unspeakable political violence. The activist left are “snowflakes” on one hand, and brutal killers on the other. In reality, political violence has long been a tactic of the right, from the labor violence that left thousands of workers dead to lynchings to brutality against peaceful protesters inflicted by corporate security and police to the harassment of women seeking abortion, the destruction of abortion clinics and the assassination of doctors who provide abortions. The rhetoric of victimization has costs -- white supremacists are committing unspeakable violence to combat the perceived threat of immigrants, Muslims and people of color. For the next four years, we are likely to have a government driven by perceptions of white Christian victimhood.